There are 6 Memory Care Facilities in the Centerville area, with 1 in Centerville and 5 nearby. To help you with your search, browse the 2 reviews below for memory care facilities in Centerville. Better rated regions include Warner Robins with an average rating of 5.0 out of 5 stars. Caring.com has helped thousands of families find high-quality senior care. To speak with one of our Family Advisors about memory care options and costs in Centerville, call (855) 863-8283. Centerville, Georgia, is a popular destination for seniors, who make up 20 percent of the city's population and enjoy the area's climate, low crime rate and inexpensive cost of living. The city is in Houston County, which is home to five memory care facilities for people with Alzheimer's disease and other forms of dementia. Memory care facilities in Georgia are known as memory care units. They operate within assisted living communities and personal care homes, featuring programs, activities and oversight systems for residents with cognitive challenges. Centerville is perfect for seniors who like watching the seasons change but could do without cold, gray, snowy winters. The average July high is a shade over 90 degrees. Although the temperature regularly dips into the 30s on January nights, the city rarely gets even a dusting of snow. With Centerville's 223 sunny days per year, memory care patients and their families have plenty of opportunities to enjoy visiting outdoors. For those considering cost as a major factor in looking for a memory care facility for their loved ones, Centerville's overall cost of living is 12 percent lower than the national average. Thanks to Georgia's favorable tax treatment of seniors, memory care patients can keep most of their money in their pockets. This can be a significant help if an unexpected health care expense arises. Among Georgia's senior-friendly tax policies are a $65,000 deduction on retirement income for residents 64 and older and a lack of tax on Social Security benefits. While Centerville has a somewhat elevated property crime rate, its rate of violent crime is far below state and national averages. Memory care residents usually have extra layers of security, including secure entrances, cameras and security staff. Memory Care costs in Centerville start around $0 per month on average, while the nationwide average cost of memory care is $4,778 per month. It’s important to note that memory care rates in Centerville and the surrounding suburbs can vary widely based on factors such as location, the level of care needed, apartment size and the types of amenities offered at each community. Centerville and the surrounding area are home to numerous government agencies and non-profit organizations offering help for seniors searching for or currently residing in an assisted living community. These organizations can also provide assistance in a number of other eldercare services such as geriatric care management, elder law advice, estate planning, finding home care and health and wellness programs. To see a list of free memory care resources in Centerville, please visit our Assisted Living in Georgia page. 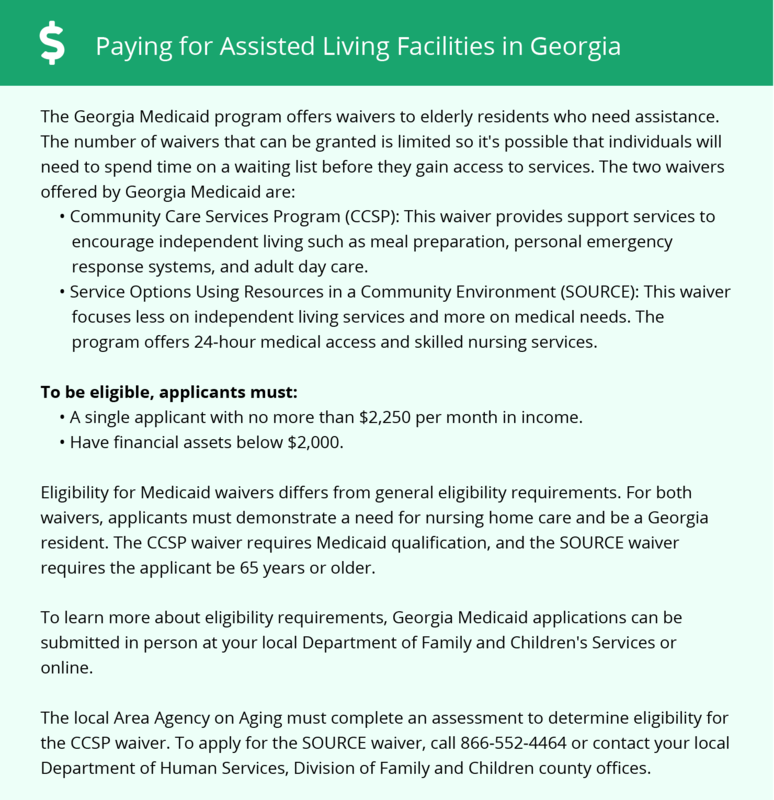 Centerville-area assisted living communities must adhere to the comprehensive set of state laws and regulations that all assisted living communities in Georgia are required to follow. Visit our Memory Care in Georgia page for more information about these laws.